Location: About 5.5 km W of Rhayader centre. One of series of dams in Elan Valley built by City of Birmingham 1893 to 1904. Engineer James Mansergh. The scheme was amongst the greatest civic achievements of the late C19. The Corporation of Birmingham employed direct labour for the scheme which involved the construction of 53 km of railway to transport materials from the Wye Valley line at Rhayader, 4 dams, an aqueduct 126 km long, and a village for construction workers. The height of the reservoirs enabled water to reach the outskirts of Birmingham by gravity alone, without the expense of pumping. 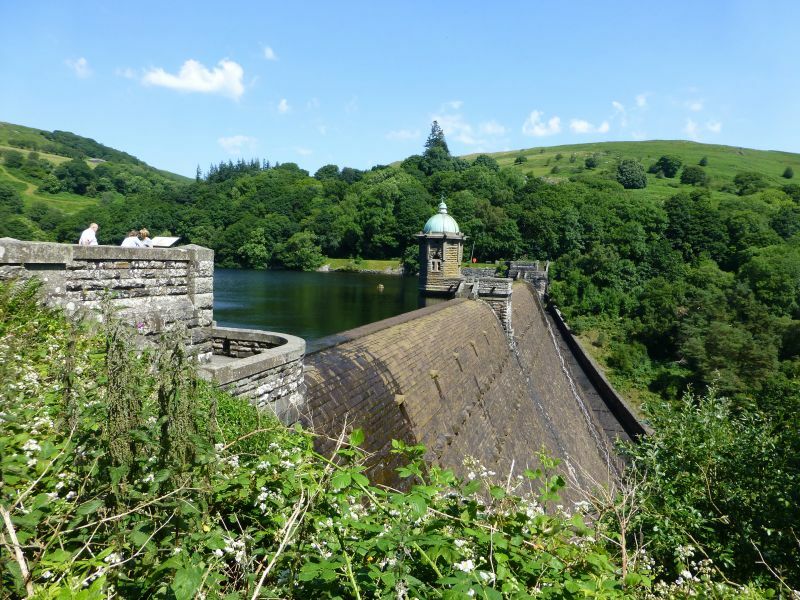 Provision was made for future expansion in the Claerwen Valley where the scheme was brought to its current state by the Claerwen dam in 1952. Estimated quantity of masonry 90,372 cubic yards"
Masonry dam with massive heavily rock-faced blocks. To ends, spillways with parapet walls, spillways broaden as they drop, surfaced with hard stone, walls turn becoming parallel to stream; arched outlets. Towards top of downstream side, series of square windows, below these 2 rows of protruding blocks (used to support scaffolding during construction). At bottom of dam, massive circular outlet with keyblock set in aedicule-like surround with piers to ends, pediment over. To each end of dam, platform with steps on downstream side down to top of dam. At centre of dam is attached round valve tower; copper dome with lantern and fish weathervane, waterspouts to circumference, beneath spouts, square windows to upper section, round arches with 2-light windows below; towards downstream side, doorway onto raised platform rising from top of dam; platform has steps to top of dam; valve tower corbelled out over narrower polygonal stage (with barred intake windows) which runs down below water level. Interior said to contain original operating machinery. Graded II* as part of one of the greatest civil engineering projects of C19.